Middle school students from Central Islip and Islip spent part of their spring break designing and building fully functional and remotely operated submersible vehicles as they took part in the Outdoor Environmental Education Program’s Spring Break ROV (Remotely Operated Vehicle) After School and Spring Recess Science Institute. The vehicles were equipped with high-resolution color cameras that transmitted a real-time video feed to the ROV pilot while students were able to “fly” their ROVs. 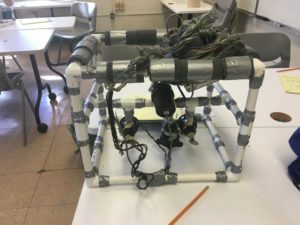 Students designed effective ROVs with “zero-bubble” buoyancy that enabled them to maneuver efficiently underwater, and utilized 3-D printers as they designed, built and tested several propeller types for their submersibles in a real engineering challenge. On April 12, these collaborative teams of students took their competed ROVs to the Connetquot River State Park Outdoor Learning Lab, where they conducted field trials. During the trials, students discovered native brook trout that were utilizing an eddy behind a waterfall as a protective habitat and shared this information with Park staff. This new OEEP STEM Institute gave students an authentic engineering challenge and real-world application as they remotely surveyed an underwater environment. The Institute was supported by the New York Institute of Technology and their STEP (Science and Technology Entry Program) in support of underserved students.